Bagel Madness: The End of Civilization? candycane bagels: the end of civilization? 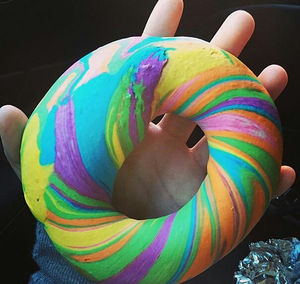 The rainbow bagel? You may not have heard about one of the latest and hottest crazes in the food universe, and you may be better off. 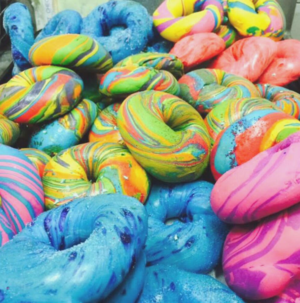 There’s a place in Brooklyn called The Bagel Store, where baker Scot Rossillo has been making rainbow bagels as a novelty item for 20 years. Business Insider recently produced a video about them, which went viral and was viewed 65 million times. As a result, demand became so intense that Rossillo had to close up shop for ten days to reorganize his operation. Is the candy cane bagel part of a conspiracy to undermine Jewish culinary culture, the inevitable result of a process that began with the cinnamon raisin bagel? 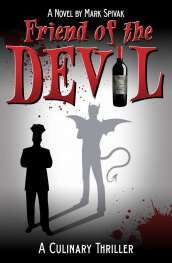 Maybe not, since the candy cane effect seems to be a visual one, achieved primarily through food coloring. Although the taste may be the same as a regular bagel, we’ve been reduced to the status of infants who can be distracted by a bright, shiny object. And when the novelty of those shiny colors wears off, we’re one short step away from interwoven strands of flavored dough that will morph the bagel into a type of cronut. You have to wonder how Mr. Rossillo would feel if someone turned his grandmother's lasagne into a carnival object. Despite his newfound popularity, Rossillo is still baking the same number of bagels each day. “Money doesn’t move me,” he was recently quoted as saying. “I refuse to cheapen my product.” Score one for Old World craftsmanship. On the flip side, Rossillo’s website advertises “The bagel that broke the Internet,” and offers potential customers the chance to get on a VIP waiting list for mail-order shipment. “If everyone else was jumping off a bridge,” you may hear your own grandmother saying, "would you put on your bathing suit?" Anyway, what’s wrong with eating a cinnamon raisin bagel? For starters, it’s not more like a variety of designer muffin---what you might be served at a trendy bed and breakfast, where the rooms have frilly bedspreads and 16 pillows on each bed. Here’s the purist point of view: if you want to eat a bagel, eat one; otherwise, buy a muffin. According to the purist viewpoint, Rossillo should be taken out and shot. But to be fair, remember that he was selling candy cane bagels long before food culture had the potential to go viral. If it were possible to remove the smart phones from the hands of the lemmings lined up at his store, and to erase the Internet completely from their lives, that line would disappear. “It’s like eating cake for breakfast,” exclaims a woman in the Business Insider video, as she tucks into a rainbow bagel schmeared with funfetti (cream cheese infused with cake mix and sprinkles). Let them eat cake, but at least let it be cake. What do you think about candycane bagels? Are they a fun novelty item, or a threat to the Jewish culture? Share your comments and insights with the community!